It's almost time for Halloween, which means that it's time for the nastiest-looking food and drink to make its appearance. Severed fingers, brains, vomit... everything that would normally make our stomachs turn at any other time of year makes us cackle with glee instead on Halloween night. 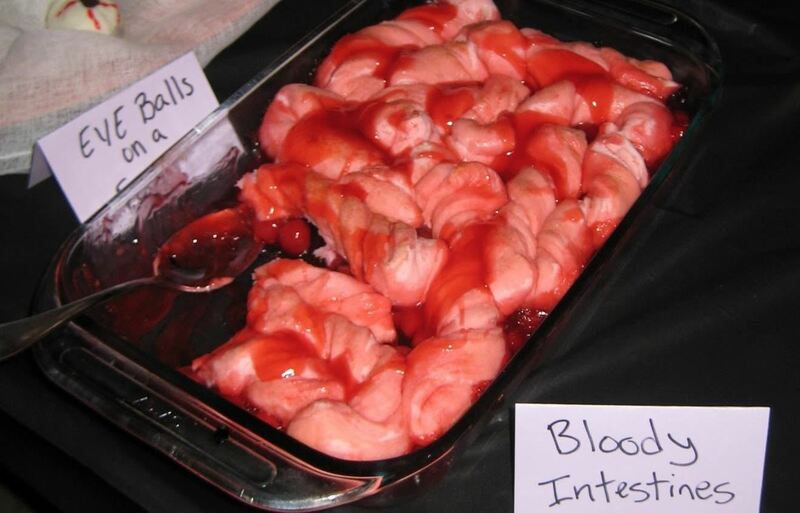 We've compiled a list of the nastiest, most stomach-turning foods around for your "enjoyment"—so embrace your inner zombie, nibble on some intestines, and grab some fantastic ideas for your ghoulish party come this Hallow's Eve. 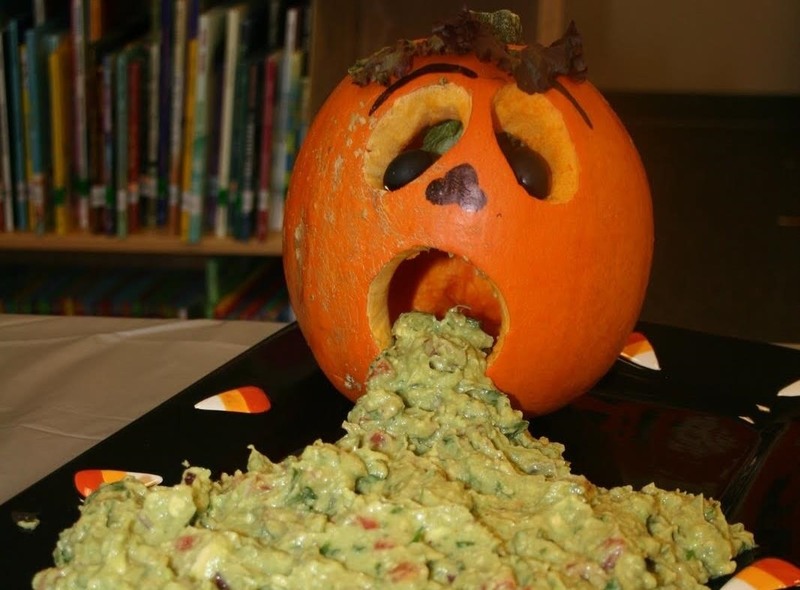 The idea of making a pumpkin blow chunks isn't a new one, but man... using chunky guacamole is truly the icing on the cake. As someone who has seen too many friends after bad bar nights... this vomit looks a little too authentic. As if the eyeballs weren't already gross enough to eat... she puts a fork in every single one! Ouch. 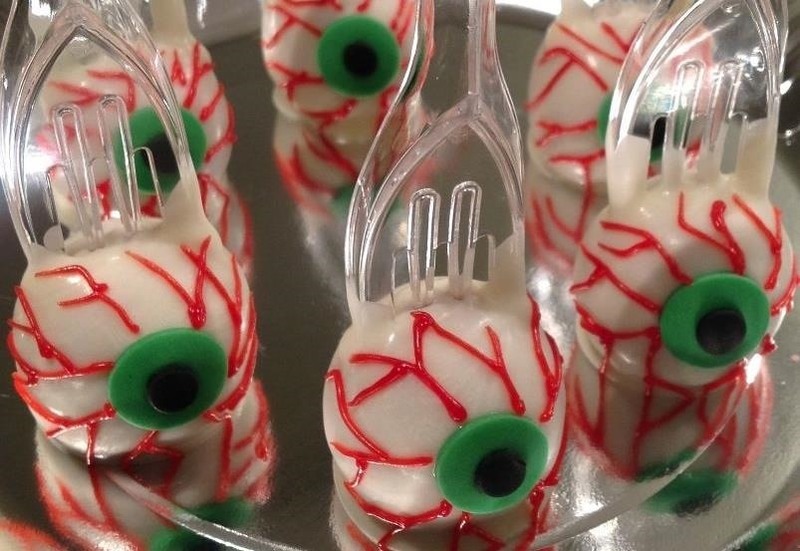 These delicious yet disgusting cake pops are the creation of Lily's Sweet Factory, a home-based bakery in London. You can find the recipe here. Talk about unappetizing... these breadsticks are strictly for the undead party guests that want to eat something to help with their "digestion." Lisa from Gourmified has the easy recipe here. Yeah, you read that right. Ugh. 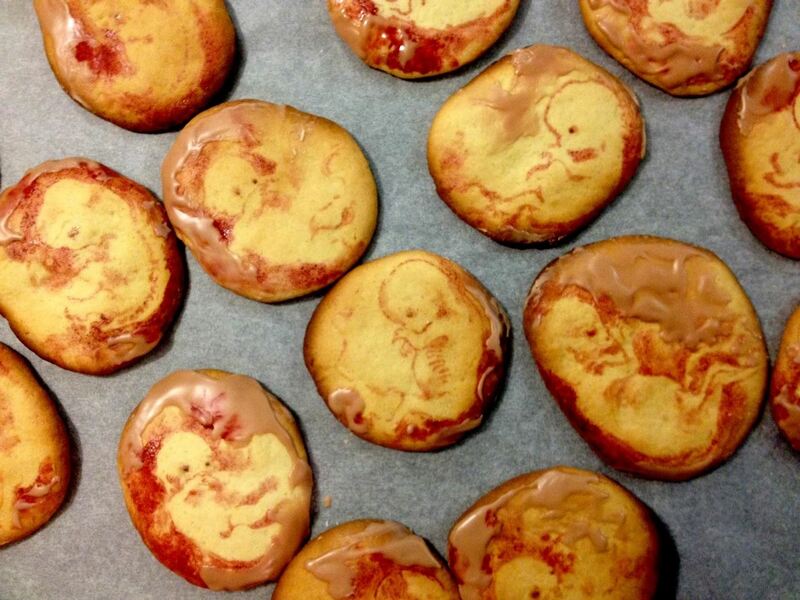 Käthrine doesn't list a recipe for these cookies, just that she used red food coloring and a paintbrush for the fetal outlines and dyed icing for the jelly. I imagine that regular sugar cookies would work well as a base. But damn... these disgusting treats go a long way in showing us that with a little ingenuity, any food can get nasty really quick. Careful... this one might actually bite you back! Semadar of COOKIEdough created these cupcakes using fondant and dye with vanilla cupcakes. 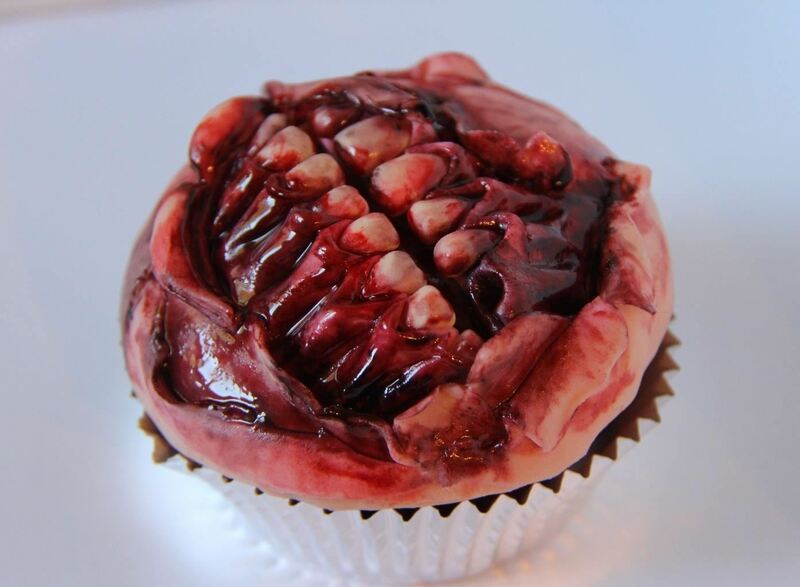 Learn how to craft your own zombie mouth here. Let's take a break and grab some refreshing drinks... oh. 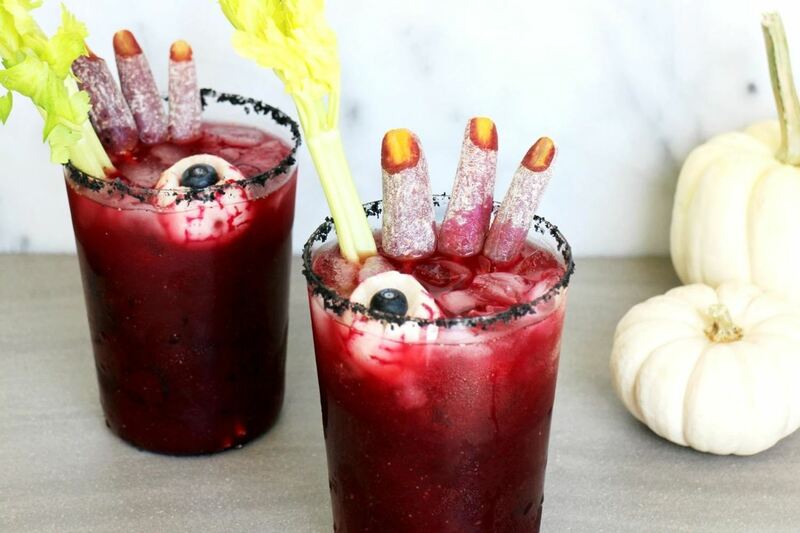 I don't know what's nastier... the blood-like appearance of the drink, the severed, bloody fingers, or the unseeing eyeballs floating in the center. If you're interested in making this nasty concoction for Halloween, the instructions can be found here. Braaiinnss... ahem. 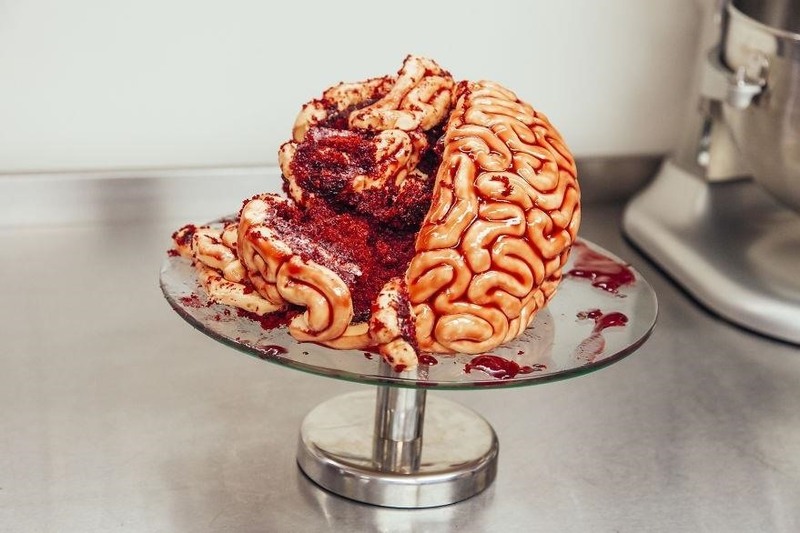 Even though I'm not a zombie, I can definitely appreciate the time and effort put into this so-realistic-it's-gross brain cake. Yolanda has both the instructions and an instructional video here. 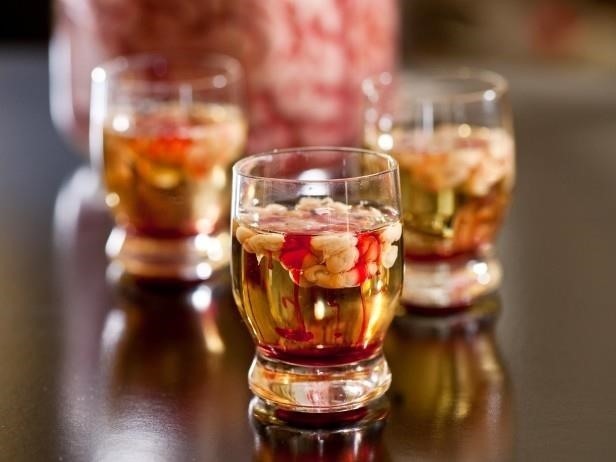 Speaking of brains... how would you like to drink brains after eating them? This awesome shooter features Bailey's in strawberry vodka with a small amount of bloody Grenadine to complete the gruesome look. For more information, check out Dan's recipe here. 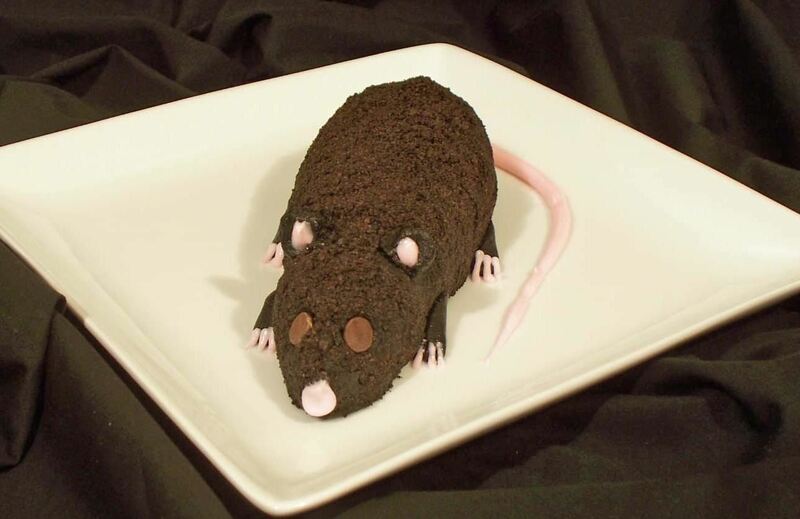 If the sight of rodents make you jump on a chair and squeal, this dessert is probably the opposite of what you'd find appetizing... but that's what makes it so perfect for your Halloween spread. The step-by-step tutorial and pictures by Beth are at Hungry Happenings. Just make sure that you let your guests know that everything on the table is edible before they dig in; otherwise, one of them might swat this little fella by accident. 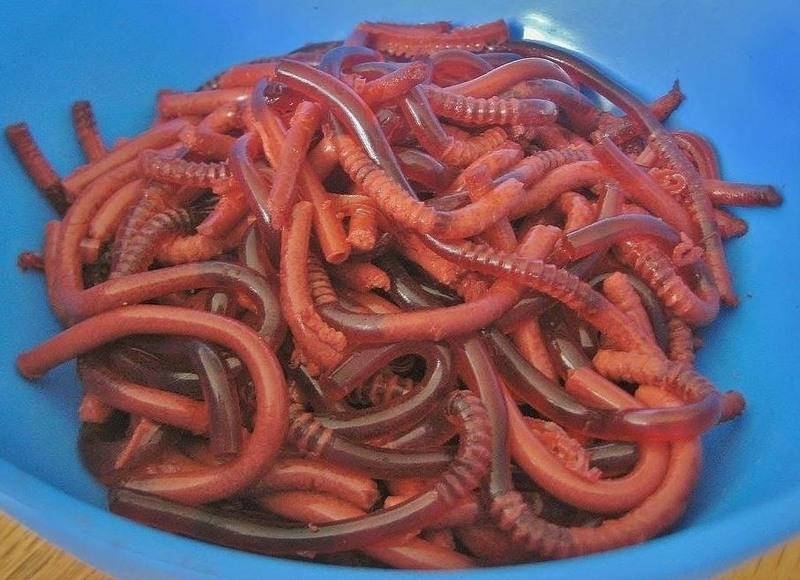 Yuck—worms are the worst. Just the thought of them slithering all over you, creeping and sliding onto your skin... ick! 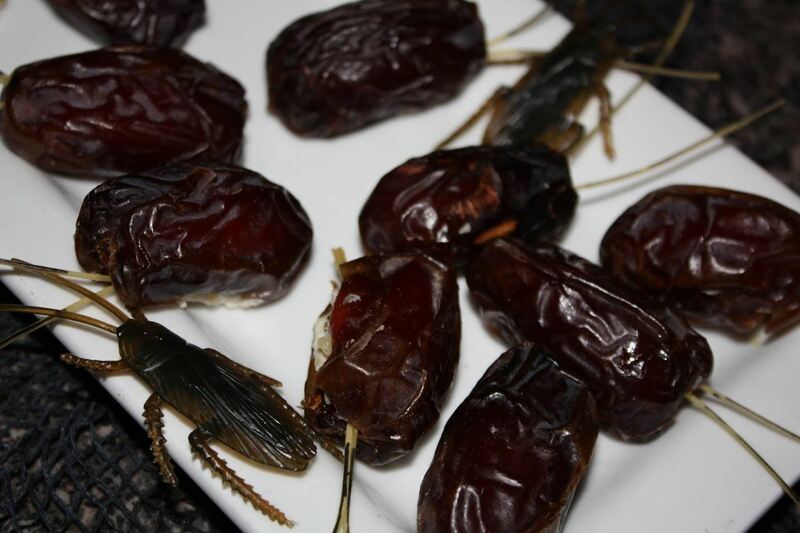 If these creepy-crawlies look like the kind of nasty fare you'd love to serve to your guests, you'll find the directions to make it the right way here. This dish is even grosser if you buy plastic cockroaches to scatter on the plate, giving the illusion of an entire infestation of cockroaches. The basic recipe is here on All Recipes, but they don't include an ingredient for the antennae; we suggest using chives (as in the image below). You can also add complimentary plastic roaches. 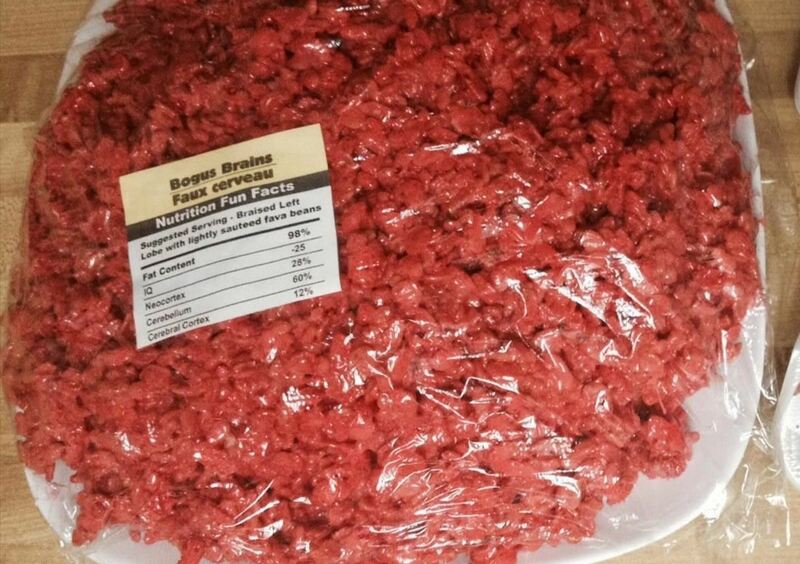 Believe it or not, this raw meat platter is actually Rice Krispies Treats with red food coloring and some creative packaging. Just follow the directions on your cereal box and add a few drops of food coloring when initially mixing the marshmallow and butter. We hope these inspired you to go out and gross your friends and family at the next Halloween party you throw (or attend). 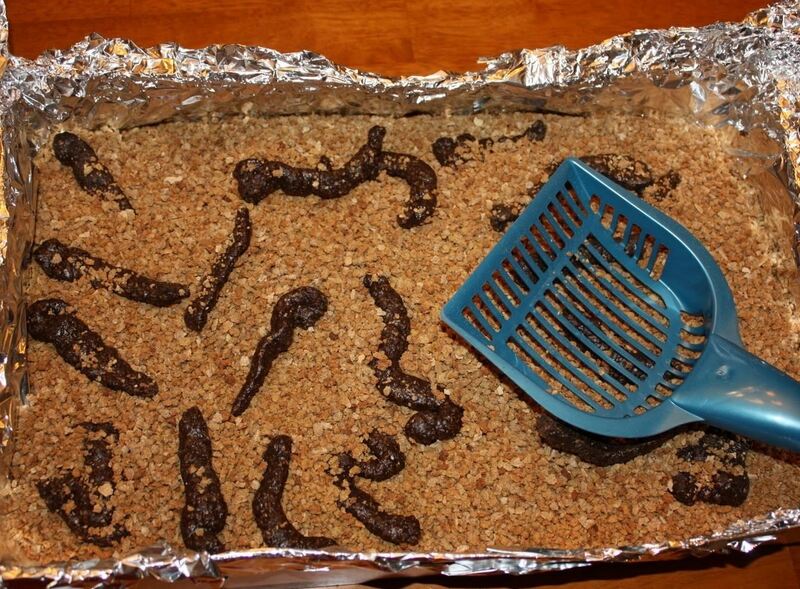 Let us know if you make any of these disgusting dishes—or any other ones—we'd love to see the pictures.